It’s not everyday perfect timing can happen. From finding each member at the right time, playing music with your father and ending up number one on a Billboard Chart, it’s all Perfect Timing for Spindfiled, MO‘s own Paralandra! Comprised of Cassandra Carson – Vocals, Paul Carson – Lead Guitar, Nick Gray – Drums, and Sawyer Rikard – Bass, Paralandra are a hard rock band with a great message and inspired storytelling that is meant to be enjoy by any person from any walk of life. It’s a rare treasure indeed when a band wants to be heard by all demographics and audiences and enjoyed. Paralandra is definitely striking lighting with their new EP entitled All Fall Down. Five heavy hitting tracks create a audible goodness of rock and storytelling that will have anyone checking twice and anticipating a full length release from this band. Cassandra Carson, frontwoman and one of the nicest musicians i’ve ever talked with decided to share with us all the band’s message. “Yeah very family oriented, we try to keep it pretty clean and um we like it to be listenable by any audience you know? She also shares her origin as a singer/guitar player: “I started playing guitar when I was 11 years old, that’s when I got my first guitar and my father taught me. I’ve been playing ever since. I started singing when I was real young you know 2 or 3 years old and then I went through a majority of my life not singing in front of anybody until I was 18. I would not do it for anyone. Then I joined the musicians university thing where you know it’s like school of rock, they place you in a band and do that stuff you know. Her musical influences: “A lot of stuff that my dad listened to. I started listening to the Beatles and that became a hug influence for me i’ve always listened to them. I listened to a lot of Van Halen growing up and so many others. How did Paralandra get together? : “Well my dad and I of course that’s a given, i’ve wanted to play in a band with him since I was 5 years old! i’ve always looked up to him, being in a band with him and being able to form something and work together has been a dream of mine. Nick Gray our drummer, he was actually a guy that I went to high school with and we were on the track team together and went to state together and stuff, we were like acquaintances. So like 2013 when I found out he was a drummer and was like hey dude let’s go jam or something and kind of like reconnected. The first time we brought him over and played it was like a instant connection we just hit it off really well with my and my dads playing. What about the name Paralandra? : “Well contrary to popular belief, It is not the combination of mine and my dads names [laughs], Paralanda is actually a book that my dad would read around the time we started the band in 2013. It’s by C.S Lewis as part of a space trilogy. Often a taboo question to ask any band or fear of being shut down on an interview, Cassandra was so cool to answer the Contrast CTRL question, Is your band family friendly/oriented? : “Yeah very family oriented, we try to keep it pretty clean and um we like it to be listenable by any audience you know? 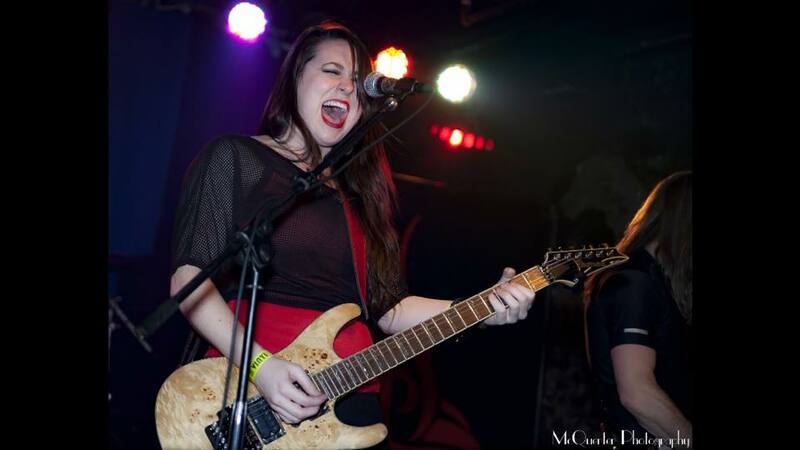 With all the laughs and jokes shared, I sincerely thank Cassandra Carson for being a fantastic person to speak with and her insights into her music and band are beyond awesome for a music fan like me and you. I’d like to welcome Paralandra into the Contrast CTRL family! Where we have many diverse and fun musicians that want to share a positive message with the world. Here is all of us at CC looking forward to what Paralandra brings next! Cassandra Carson, Contrast CTRL, Family, Feature, Interview, James West, Music, Paralandra, Rock. Bookmark.